We don’t really do a lot of Public Service Announcements here on 3DK, but every now and then something Very Important pops up and I feel an intense need to share it with the world. That need, after all, is why the blog was invented, right? And then we bought a butter dish. It was a clear glass butter dish. No ceramic cows for our household, and my suggestion of a butter bell was met with skepticism. Plastic seemed too shabby, so we went with the $4 glass covered dish from BB&B. Everything seemed fine until we left a stick of softened butter on the dish, covered it, and placed it in the fridge. The butter solidified and stuck to the top of the cover. All of a sudden, we had to use the butter dish upside down (take the bottom off, turn the cover upside down, scoop out butter). I tried looking for a larger butter dish (thinking we had just bought some dumb, cheap version that didn’t fit). I found a really cute plastic/rubber one at Home Goods, with markings on the outside to measure off tablespoons and a sliding pusher that would push butter out the end so you could neatly slice off pats. But it was too skinny. Our fat butter sticks were squatty and too high. I would have had to remold the butter stick to make it work. And then, Travis did some internet research and discovered the truth: butter sticks east of the Rocky Mountains are longer and skinnier than butter sticks west of the Rockies. Most butter dishes are designed for east-of-the-Rockies butter sticks (which makes no sense – what about us West coasters??) Also of note, a butter stick is almost 9 tablespoons by volume, even though the markings on the wrapper show 8 tablespoons. Anyway, the point of this crazy rambling post is this: we have located a butter dish (albeit, a plastic one) that is designed to hold west-of-the-Rockies butter sticks. We found it at BB&B and I could swear it was not there when we first started our butter dish hunt. We’ve been using it for a few weeks now, and our butter does not stick to the cover at all. My only gripe is that the bottom part has a ridge around the edge and I’m worried that over time I’ll just slice it off with a knife trying to get to the butter. Perhaps we’re the only ones with such nitpicky requests of the butter dish. At the very least, I’ve clued you in to the conspiracy that the butter industry is pushing an extra tablespoon of butter into your diet without you knowing! 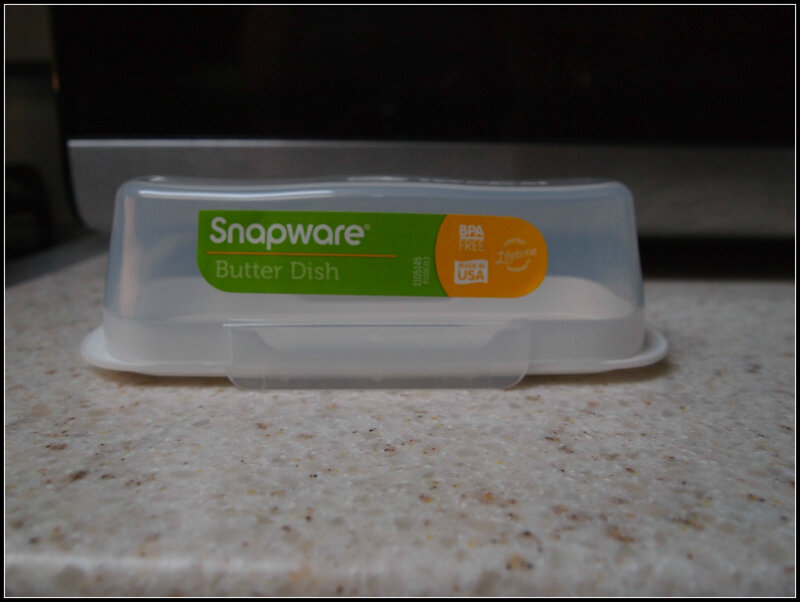 This entry was posted in food, product review and tagged butter, butter dish. Bookmark the permalink. This is very interesting! Thanks for sharing! Now I’m going to look at my butter! haha I have noticed that the lines on the wrapper don’t match up to the stick. Again, I love info like this so thanks for posting! How neat! I never knew that there was a difference with the size of butter dishes and sticks of butter. I have a cute glass butter dish (it’s round with a bell type dome) but the problem with that is I have to cut down the stick to make it fit. I should have titled this post: Expose! The truth about your butter and what butter dish companies don’t want you to know! Your round butter dish sounds cute. I picture something that’s the perfect size to display a cupcake! I didn’t know there was a difference between butters! Interesting. We have one of the little butter things where you leave it out on the counter with water to prevent it from going bag. But now it holds pepper because we all hated cleaning the dish. Ooh, I had been thinking of getting a butter bell. I’m glad to know it’s kind of a pain to clean. I never knew there was a difference in shape/size with butter sticks, either! 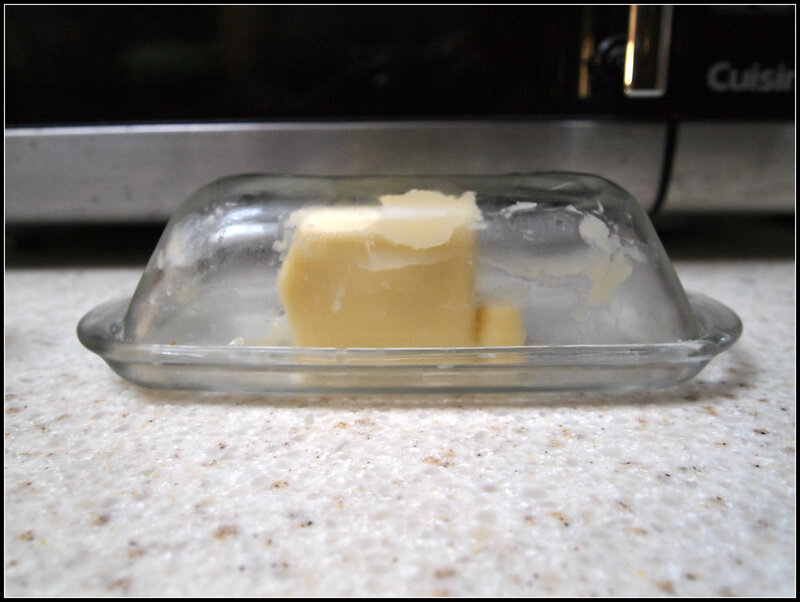 I just thought butter dish manufacturers were clueless because no butter dish ever fit my butter! There is a difference between East coast and West coast butter stick sizes, as well as Best Foods mayo on the West coast, and Hellman’s on the East coast. Same mayo, different name. Who knew??? I’m not alone!. I’ve been looking for a butter dish for us “westerners” for months!!!! How com manufacturers never bothered to cater a market including cities like Los Angeles, San Francisco, Phoenix, etc. etc. We are not just a few little towns!!! Nora! I found the PERFECT butter dish at Bed Bath & Beyond, made by OXO (of course!) It even has tablespoon markers for both “western” and “eastern” butter sticks. I’ve seen those already, now they’re easy to find. But I don’t really like them because they’re too big for me. Now this wouldn’t be a problem for everybody, but for me it is. I have a very small space for the butter, a little “door” in the fridge door (silly manufacturers!). In any case, I do appreciate a lot that you answered my comment, and you did so promptly. Look for vintage west coast China, like Bauer. They made appropriately sized butter dishes. Butter dishes made for the UK also seem to be more appropriately sized. I have been on a quest for proper western butter dish. My wife found one online she says was UK style. I don’t know where she got it, wether she ordered it from overseas or what. Dors this dish have a knife holder? Not a very clear pic?